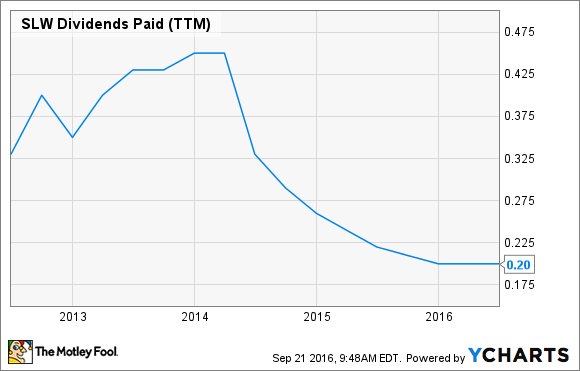 Is a Big Dividend Increase on the Horizon for Silver Wheaton Corp.? The silver streamer has an unusual dividend policy that suggests higher payouts are coming. Silver Wheaton (NYSE:SLW) isn't all that appealing to income investors at the moment. Not only is its current yield less than 1%, but the company's dividend has fallen in recent years due to slumping silver and gold prices. However, with the price of precious metals spiking this year, and new cash flow streams coming online, Silver Wheaton's dividend could head meaningfully higher. Most mining companies have a pretty standard dividend policy. They pay a flat rate each year, increasing the payout when market conditions are favorable, and cutting it when conditions are not. For example, senior gold miner Goldcorp (NYSE:GG) adjusted its dividend policy earlier this year, shifting from monthly payouts to quarterly distributions. Further, Goldcorp reduced the annual flat rate due to weak market conditions; the company's desire was to maintain an investment-grade balance sheet by reducing its leverage while still paying a sustainable dividend. That said, in its view, a sustainable dividend is a flat rate that it can maintain throughout the precious metal price cycle. Silver Wheaton takes a different approach. It links its dividends to operating cash flow, with a policy of distributing 20% of the previous four quarters' operating cash flows to investors via dividends. Under that policy, the dividend fluctuates on a rolling basis. While the dividend has been relatively steady (and low) over the past two years, it could be on its way up given the company's recent improvement in cash flow, and its projections for even higher cash flows in the future. As the chart below shows, Silver Wheaton's dividend has not budged for nearly two years despite a noticeable improvement in operating cash flow over the past few quarters. In fact, over the trailing twelve months, Silver Wheaton generated $1.17 per share in operating cash flow, but only paid $0.20 per share in dividends, which is about $0.03 per share below the 20% target. Contrast this with the prior twelve months, when it generated $1.11 in operating cash flow and paid out $0.21 per share in dividends, which was within a penny of the 20% target. This suggests that the company has some wiggle room to increase the payout in the near term, likely by $0.01 per share on a quarterly basis. That said, cash flow could increase substantially in the future due to rising precious metal prices. This was something CEO Randy Smallwood hinted at last quarter. He praised the performance of the company's assets during the recent volatile period for precious metals prices, while further noting that those assets position the company to "reap even more robust cash flows when commodity prices turn." In fact, he said that the company "look[s] forward to demonstrating to investors how powerful our cash flow generation can be in an environment of increasing precious metals prices." The implication here is that Silver Wheaton could be right on the cusp of a substantial surge in operating cash flow if silver and gold prices continue rising. If that happens, the company's dividend could move sharply higher over the next year as that rising cash flow gets factored into the equation. Based on its dividend policy, it would appear that Silver Wheaton's dividend has some near-term upside, given that it has not paid out 20% of its operating cash flow over the trailing twelve months. That said, there's a potential for even greater increases if precious metal prices improve because the company anticipates a windfall of cash flow. If that comes to pass, it could make Silver Wheaton a compelling dividend growth stock.